You cannot just carry a heavy kayak to the river without any help, can you? Well, some of you can. That doesn’t mean you will bring a kayak all the time on your shoulder. It is discomforting. Only a kayak cart can make this task simple for you. Today, in this article we are going to present ten best kayak cart of the present time. A kayak cart is a vehicle that is used to carry a kayak. This is a handy vehicle not so expensive as well. You can surely get one within your range. In the following list, we will show you several types of kayak carts. Some of them are universal, and some are specially designed for a specific boat. Shopping for a best kayak cart is not an easy task as it seems. The market has wide a verity of kayak carts. Not all of them are worth buying. Most of them are useless for the price. The humongous options often make people confused especially the novice people. The very first product in this list is the TMS CART, considered as one of the best in the market today because of its fantastic construction and outstanding performance. The cart is more extensive and broad enough to fulfill your need. 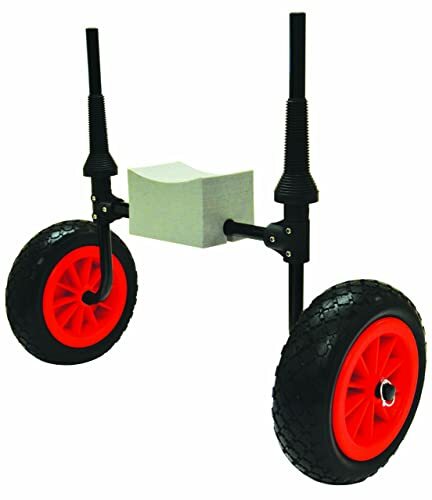 It is an all-purpose cart made of solid metal frame and foam bumpers that enhances the durability noticeably. The cart comes with 120lbs of capacity that means it can handle any kayak comfortably. The 12ft long tiedown strap is also included for keeping the kayak secure and correctly in the place. The loading and unloading seem more comfortable than ever with the 9-1/4″ H Spring-Loaded stand. The wheels are large and roll smoothly across any surface including sand and gravel. The assembly is easy and quick. The TMS CART-CANOE/KAYAK-KY001 Boat Kayak Canoe Carrier Tote Trolley surely is a fantastic option for the price. Try without any fear! If the capacity of the above product seems insufficient for you, no worries, we’ve another one that will surely fulfill your need. Yes, we are talking about the C-Tug Kayak and Canoe Cart known as a heavy-duty trolley cart for its incredible built quality and immense capacity. The cart offers a maximum holding capacity of about 300lbs. The assembly is more comfortable without the need for any tools, and it can break down to seven pieces for easy cleaning and storage. The versatile cart is adjustable and supports several types of the kayak. It will not slip as it rests on high-quality rubber pads. Your kayak will stay in the right place with a standard strap. Compared to all the other options here, this kayak has the highest capacity. If you want to carry two kayaks or a kayak with tons of equipment, this is the right kayak for you. The wheels can perform better in any terrain, no matter whether the terrain is rough. 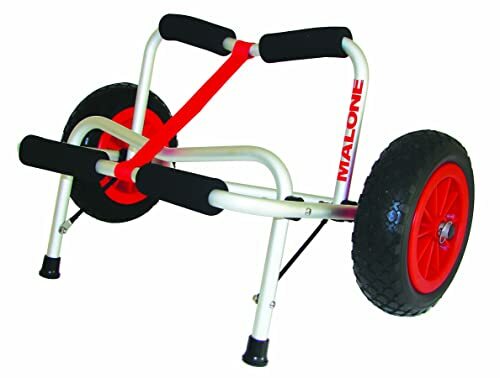 Malone Clipper Deluxe Universal Kayak Cart is the third entry on our list. It is another excellent option of the present time with robust construction and fantastic performance. This best kayak cart can hold a maximum of 200 pounds. Don’t you think it is impressive? You can carry almost every type of kayak on this cart. You can put a loaded kayak on the cart without having any issue. The cradle where you can put your boat has oversized padding that will keep your kayak safe by preventing damage. There is stabilizing locking kickstand included on the kayak and also has a long strap to keep the kayak in the right place on the go. The Malone Clipper Deluxe Universal Kayak Cart is a universal kayak carrier. The flat-free wheels are large and removable. The product will leave you satisfied that’s a promise! The Malone Xpress Scupper Kayak Cart is specially designed only for sit on top kayaks or the kayaks with scupper holes. If your kayak is not this type, you should consider something else other than this cart. The kayak cart is made on a robust platform with two height scupper holders that are adjustable. The design of the Malone Xpress Scupper is simple than other kayak carts available in the market. If you remove the wheels, it is almost entirely flat. Maximum weight carrying capacity of the cart is about 200 pounds. Besides, it will let you adjust the pressure with a friction screw. Overall, the Malone Xpress Scupper Kayak cart is one of the best for carrying any seat on top kayak with scupper holes. The wheels are large and run smoothly over any terrain. Looking for a kayak cart that can run smoothly over any terrain? The TMS CART-CANOE/KAYAK-KY001 Kayak Cart is your solution. 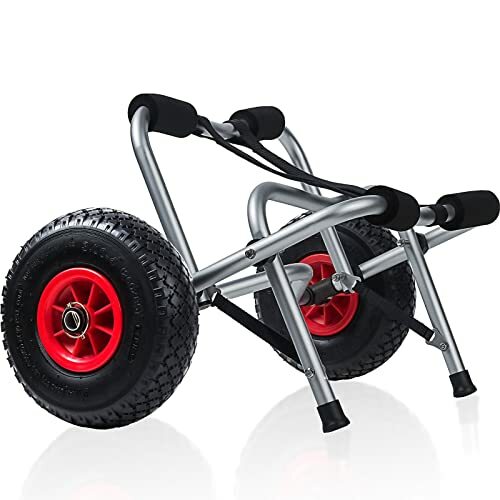 The fantastically build wheels of the cart will let you run the vehicle over any terrain without any problem. The product is made of a solid metal frame. 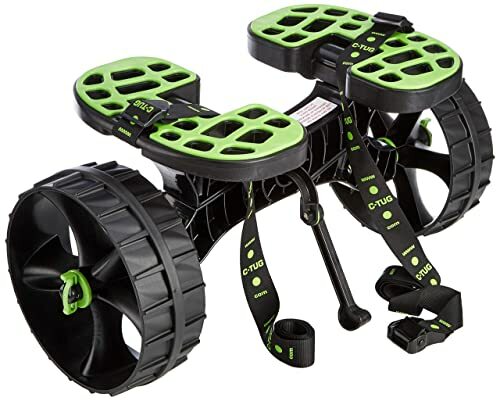 Thus, it offers a maximum of 120LBS of weight carrying capacity. The cart features foam bumpers on each arm. The bumper will perfectly protect your canoe and kayak from any unexpected impact. 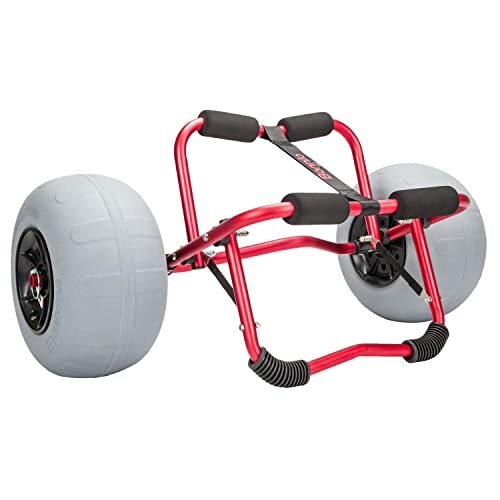 There is a sturdy double-leg kickstand included that will let you load quickly without any issue. Overall, the TMS Cart is one of the most excellent options for the price. It is everything one desires from a kayak cart. I can proudly declare this one is one of the best choices of the present time. Admittedly, it will fulfill your demand. 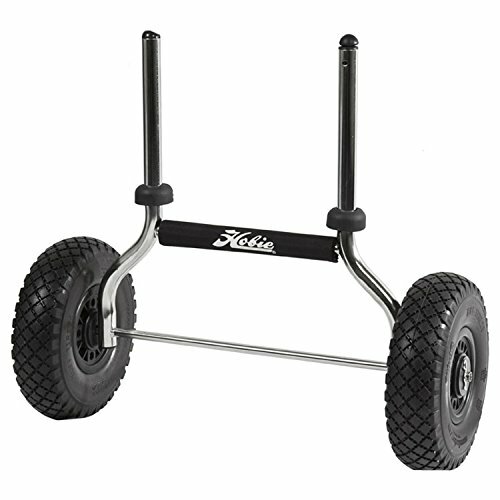 The Hobei Heavy Duty Plug-in Kayak Cart is the epitome of quality carts. It is made of top quality stainless steel materials. The cart can withstand a maximum of 150lbs of weight. You can carry any kayak in this weight range. The assembly is simple than ever, and the wheels are sturdy. The cart can run over any rough terrain without any problem. Also, they are removable in case you need. The price of the Hobie Heavy Duty Plug-in Kayak Cart is reasonable for such quality. We are quite sure that you will love to have them for carrying your kayak. The cart will defiantly serve its purpose. The Bonnlo is one of the trusted names in this field. 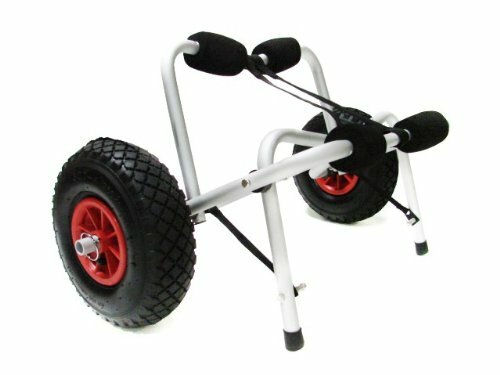 For several years they are making and selling top quality kayak carts. Their products are solidly built with quality materials, and they sell those products at a reasonable price. The Bonnlo Kayak Canoe Boat Cart is an example of their fantastic class. Solid aluminum frame and foam bumpers make the product way more convenient than many other options in the market today. The foam bumpers will keep your kayak or canoe protected while carrying. The cart offers a maximum of 165lbs of carrying capacity. It folds down easily for convenient transportation and storage. The 10″H spring-loaded stand will keep cart popped up onshore for quick loading out of the water. The strap that is included with the cart will help you to fasten your kayak properly while carrying. Overall, it is an excellent product at this price range. 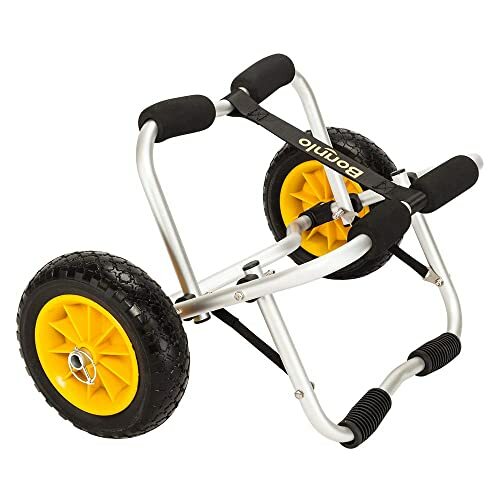 The Bonnlo Kayak Cart Canoe Carrier Trolley with No-Flat Airless Tires Wheels is another excellent product for the price. It has everything one wants from a kayak cart. The built quality of the cart is incredible with the highest grade materials. It is designed to last and serve you better for years. The maximum capacity of the kayak cart is 165lbs. You can easily transport kayak and canoe within this range. Also, there are foam bumpers included on each arm that will keep your kayak or canoe safe while carrying. The cart folds down easily for storage. It comes with two bungee cords, hook and 12 ft spare Tie-down strap. You can securely carry the kayak with the belt. There is a 10-inch spring-loaded stand included for quick loading out of the water. The price of the product is reasonable. You can give it a try for a fantastic experience. 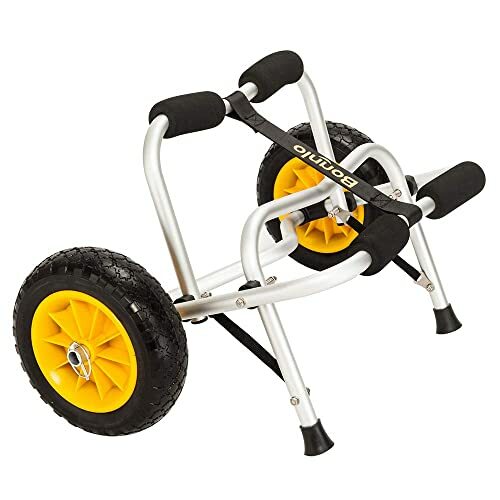 With fantastic construction quality, The Kayak Cart Dolly Wheels Trolley offers a capacity of 165lbs. It is sturdy and defiantly a long lasting model. The product is corrosion-resistant. There is a cam buckle tie down strap included securing the kayak, canoe or any small boat. The ten-inch all-terrain pneumatic tires are fabulous. They serve the purpose by rolling smoothly over any surface. There is foam cushion on the bars to protect the kayak or vehicle from bumps, scratches and other abrasions. For storage, you don’t have to worry anymore. It folds flat easily for transportation on your car, truck, van or SUV. When folded the size is tiny. You can store the cart anywhere you wish. The BonnloBoatKayak Canoe Cart Carrier Dolly Trailer Tote Trolley Transport is the last entry in this list, not the least. Like all the above products, this too also comes with solid construction. The durable aluminum frame with foam bumper makes it way more convenient than most of the products in the market. The maximum capacity of the product is about 165lb. You can carry kayak/canoe within this range. The tires are large and solid rubber made that roll smoothly across the sand, gravel and many other surfaces. 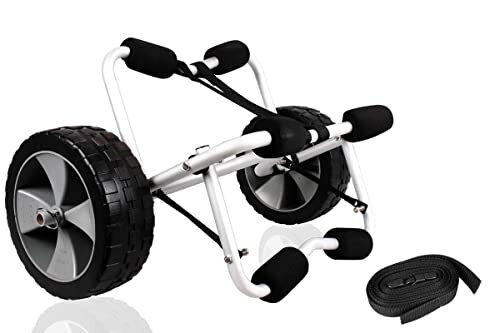 The Kayak cart is easy to assemble without any tools, and it breaks down quickly as well. Meaning, transportation, and storage is not a problem with this product. For quick loading out of the water, the cart has 10″H Spring-Loaded stand included. The primary purpose of the kayak cart is to make your life easier by carrying heavy kayaks. If you have the right kayak cart in your hand, you don’t have to lift heavy weight anymore. But the question is how to determine which kayak cart is ideal for me? For that you need to consider the following: You should know the type of your kayak and the attachment method of the cart. This two must match with each other. If you consider those aspects, you will notice all of the above best kayak carts meet the requirement of being the best. You can have one from the list without any doubt. This is the time to leave. We will get back to you soon with other outdoor product reviews, tips, and tricks. Feel free to comment you have anything to know.